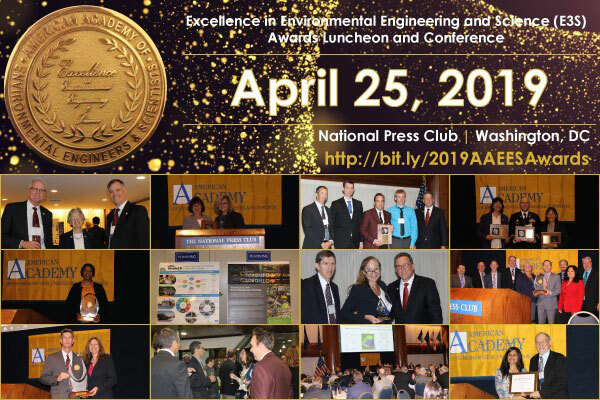 The 2019 Excellence in Environmental Engineering and Science (E3S) Awards Luncheon and Conference is being held at the National Press Club in Washington, D.C., on April 25, 2019. This event celebrates the winning entries in the 2019 E3S and Environmental Communications awards competitions. In addition to technical presentations by the E3S Competition Superior Achievement and Grand Prize winners, the program will feature a review of the National Academies of Sciences, Medicine, and Engineering study on the Grand Challenges for Environmental Engineering in the 21st Century. The study brought together experts in a wide range of fields who, with input from the scientific community and the broader public, identified the foremost challenges that environmental engineers and scientists will be expected to address over the next several decades. The study also describes how practitioners in the field — with assistance from colleges and universities — will need to evolve to better address those challenges. Featured Grand Challenges speakers are Dr. Domenico Grasso, Chancellor of the University of Michigan Dearborn, who served as Chairman of the study effort, and Dr. Rula Deeb, Vice President of Geosyntec, who will present a practitioner’s perspective on incorporating the grand challenges into the work they perform on behalf of clients and stakeholders.